The welfare of wild-caught fish has so far received little attention. Why is this so? Every other industry which deals with animals, at least in the UK (with the notable exception of pest control), has had to engage seriously with animal welfare issues. There are a range of possible reasons why this has not been the case with the fishing industry. People empathise less with fish than they do with birds and mammals and some even question whether fish are sentient. It all happens out at sea and generally out of mind. It is also seen as a difficult issue to deal with. It may well prove impossible to catch a wild fish in a genuinely humane manner. To see how they could rise to the challenge, their contributions to the welfare of fish, and other aquatic animals, to date are discussed below. A table showing some positive developments in fish welfare (and related issues) is also given below (see some positive developments). The role of animal welfare scientists in providing evidence for fish sentience is discussed on the fish are sentient pages. Some of this research has been widely reported in the media (e.g. fish do feel pain, scientists say, scientists highlight fish intelligence and goldfish can feel pain, say scientists. Animal welfare scientists will have a key role in developing welfare codes of practice for commercial fishing, and in the development of humane slaughter technology for use on fishing vessels. Humane slaughter technology has recently been developed, by scientists at Bristol University, for wild-caught lobsters and crabs (see crustastun). Humane technology has been developed in recent years for some farmed fish species, such as humane electrical stunning for trout and automated percussive stunning for salmon (see seafood innovations). This technology needs to be adapted for use at sea. Other technologies for landing fish with minimal injury and stress also need to be developed. Another promising development is the interest in the welfare of wild-caught fish shown by the Fisheries Society of the British Isles in organising its “symposium of fish welfare and fisheries” in October, 2008 (see Scientific papers). The suffering of fish in commercial fishing is increasingly recognised by vegetarian-orientated animal protection groups. Several animal rights groups have written about it in the UK and USA, such as Vegetarians International Voice for Animals (see viva); Animal Aid (see the fish buisness); the Vegetarian Society (UK) (see vegsoc) and People for the Ethical Treatment of Animals (see fishing hurts), arguing a humane case for not eating fish. However, within animal welfare organisations, the suffering of wild-caught fish is largely off the radar. Several animal welfare groups have campaigned against practices that cause suffering to fish. The focus has tended to be fish farming, and to a lesser extent, angling. They have campaigned through a number of different channels including science-based reports, supermarket and government lobbying, animal welfare certification schemes, funding research, and through education of industry and the public. fishcount.org.uk is aware of just 2 animal welfare organizations that are working on the welfare of fish in commercial fishing. The Dutch Society for the Protection of Animals, the largest animal rights organisation in the Netherlands, has worked with the Dutch government to commission the study of fisheries slaughter methods (discussed in humane slaughter), with a view to improving welfare. It continues to lobby government and supermarkets to address the suffering of wild-caught fish and hopes to set up a welfare certification scheme similar to fair-fish. fair-fish (see fair-fish) is a Swiss campaigning organisation for fish welfare that is currently developing a welfare certification scheme as a pilot project for artisanal fishers in Senegal. This is the only certification scheme ensuring humane treatment of wild catch fish and assures standards for animal welfare, conservation and fair trade. fair-fish certified fish must be killed humanely by percussive stunning with a priest followed by bleeding, and the whole process of capture and death must take no longer than 30 minutes (or 5 minutes for fish caught by hook). fair-fish allows hook and line, encircling gill nets and beach seines as acceptable methods of capture. Other fishing methods may be introduced at a later time. Conservation and environmental groups raise awareness and concern for the impact that commercial fishing is having on the marine environment, and its biodiversity. They urge for urgent action to address the decline in fish stocks. They campaign for the introduction of large nature reserves in the sea that are protected from fishing. They campaign for action to address the birds, dolphins, sharks and turtles killed by fishing gear, and the wasted lives of fish and other animals caught as bycatch and thrown back into the sea dead or dying. They investigate and report illegal fishing, calling for tougher enforcement of fishing regulations. 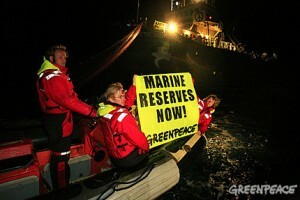 Greenpeace crew confiscate illegal driftnet in the Mediterranean. The measures needed to make fishing more sustainable, and to protecting the marine environment, will be central to a strategy for reducing the suffering of wild-caught fish. For some people, concern for wildlife begins with a concern for animal welfare. Therefore, highlighting the fact that overfishing exacerbates the suffering of wild-caught fish could, perhaps, help widen the support for marine protection. The “Save the Whale” campaign was started as a conservation campaign by Greenpeace, but would it have gained as much public support if people did not also care about the suffering of these animals killed by exploding harpoons? Supermarkets can help raise animal welfare standards by giving shelf space to high welfare produce (such as that certified by the RSPCA Freedom Foods or Soil Association Organic schemes) and by setting their own minimum welfare standards (such as not selling any eggs from caged hens). Most supermarkets stock farmed fish certified by such welfare schemes. Supermarkets are also recognising the environmental problems caused by commercial fishing, and most stock wild fish carrying the Marine Stewardship Council (MSC) logo which certifies it was fished from a sustainable source (of course in this context sustainable does not mean humane). However, they have not so far recognised that the welfare of commercially-caught fish is, to put it mildly, “poor” and have not provided a higher welfare alternative (e.g. fish caught to fair-fish welfare standards). Supermarkets and other retailers have influence over their suppliers and can encourage them to meet higher welfare and environmental standards. For example, Waitrose is encouraging measures to reduce bird bycatch in the long line vessels that supply it. It could, for example, also encourage its supplying fishers to avoid live bait, a particularly abusive treatment of fish. There are a number of ways that supermarkets can seek to improve welfare, such as setting standards for its suppliers, clearer labelling and sponsoring research, once they recognise a welfare problem. Unlike the farming industry, the fishing industry has been allowed to work in an animal welfare vacuum, at least as far as fish are concerned. This seems morally unsustainable as the demand for humanely produced food grows. There is a need for fishers to seek ways of reducing the suffering of the fish they catch and this could well bring economic benefits to them. Fishing in better managed, healthier fish stocks reduces fuel costs since less fishing effort will be required where stocks are in abundance. Reducing bycatch saves on labour costs. Using faster and less stressful methods or capture and killing can improve eating quality. A UK fisher, recently interviewed on radio 4’s Farming Today, stated: “the future of fishing is in quality”. Animal welfare is a key part of good quality. The growth of the free range egg market in, for example, the UK from almost nothing to around 50% of whole eggs sold, despite the fact that free range eggs are more expensive, demonstrates the economic benefits of animal welfare. “the total allowable catches (TACs) agreed each year in Council of are much higher than those recommended by scientists”. Tougher action from governments is needed to reduce the numbers of fish caught by effective restrictions on fishing effort, and more selective ways of fishing. There are already pressing reasons why governments should take tougher action to reduce levels of fishing and to make it more sustainable. The suffering of fish is another reason for doing so. Governments and inter-government institutions, including the EU and the OIE, have begun to recognise the sentience of fish. The Council of Europe has published recommendations on the welfare of farmed fish. The OIE is currently developing welfare codes for farmed fish and these will give a framework for future legislation. It seems likely that these codes will will state as unacceptable the inhumane slaughter practices that have been common in the industry, e.g. carbon dioxide stunning, asphyxiation in air and prolonged pre-slaughter starvation. Governments and inter-government institutions have also funded research into farmed fish welfare. “The greatness of a nation and its moral progress can be judged by the way its animals are treated”. Assurance schemes are a powerful means by which consumers can exert pressure on industry to become more humane or more sustainable. The RSPCA “Freedom Foods” scheme and the “Soil Association” organic scheme are two examples of current UK welfare assurance schemes which assure welfare standards for farmed fish during slaughter and rearing. There is a need for assurance schemes that give animal welfare standards in wild fish capture. There are currently no such schemes besides the Swiss fair-fish scheme (see above), which is currently being developed for artisanal fishers in Senegal. One possibility is that existing welfare schemes could be expanded to cover wild-caught fish. It is also possible is that a marine conservation assurance scheme, such as the Marine Stewardship council (MSC), could broaden its scope to include welfare of caught fish. Another possibility is the creation of new assurance schemes for the welfare of wild-catch fish, similar to the Swiss fair-fish scheme. Table to show some recent developments fish welfare (and related issues) 1980-2008. 2 1994 UK Shellfish Network founded to campaign for humane treatment of lobsters and crabs. 4 1995 UK Welfare of Animals (Slaughter or Killing) Regulations 1995 (implementing EU Council Directive 93/119/EC) covers farmed fish in its general requirements. (NB this legislation does not set specific requirements in terms of permissible humane methods for the killing of fish). 14 2002 UK Fisheries Society of the British Isles publishes its welfare briefing paper. 15 2002 UK Sainsbury’s makes a commitment to source all its wild fish from sustainable sources by 2010. 16 2003 UK BBC News reports “Fish do feel pain, scientists say”. 17 2003 UK BBC News reports that fish “do not deserve their reputation as the dim-wits of the animal kingdom”. Books: Do fish feel pain?